This mid-term evaluation reports on a project currently being implemented in Georgia by PRI’s South Caucasus office: Supporting the improvement of service provision for women offenders who have experienced violence and discrimination and their vulnerable children. 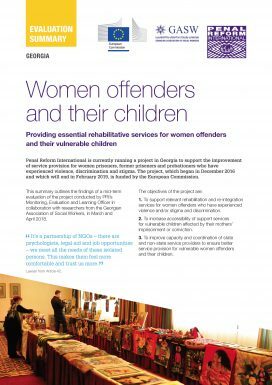 The project aims to provide essential rehabilitation and re-integration services for women offenders and increase accessibility of support services for vulnerable children affected by their mothers’ imprisonment or conviction. It also aims to improve the capacity and coordination of service providers. Services include legal aid, psychological counselling, medical services, vocational training, start-up grants for small businesses and work opportunities. The project is in line with Bangkok Rules guidance on ensuring gender-sensitive rehabilitation programmes for women prisoners, to aid their reintegration back into society. The evaluation was conducted by PRI’s Monitoring, Evaluation and Learning Officer in collaboration with researchers from the Georgian Association of Social Workers in March and April 2018. The 26-month project, which began in December 2016, is funded by the European Commission. A summary of the mid-term evaluation has also been produced, which can be downloaded below. The evaluation was carried out as part of PRI’s commitment to learning and accountability and to delivering the best projects and services to the people we serve.